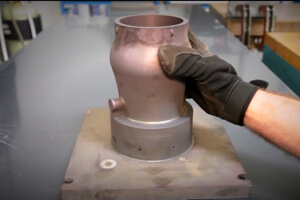 In a recent video (below), Musk shows off a project he hopes will speed design and fabrication of spacecraft parts. Not only does it look cool, but it combines three technologies that have captured the imagination in the last couple years—the Oculus Rift, Leap Motion controller, and 3D printing with metal. It’s tempting to take this video as more than it is. The technology looks like Iron Man, but it isn’t Iron Man. More exciting than sci-fi comparisons is the fact a group of really smart, open-minded engineers see potential enough to experiment. A veteran aerospace engineer recently told me one of the most amazing things happening in new commercial space companies, like SpaceX, is the speed of design to trial. A process that once took years now takes months. And Musk, who is relentlessly pushing the industry forward, wants things to move even faster. The idea is simple. We use 2D input methods (a mouse and keyboard) to manipulate 3D spaces. It’s counterintuitive, takes time to learn, and although it can be very precise, is time consuming, even for the best designers. 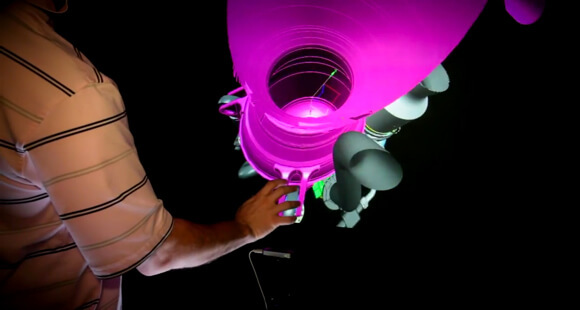 David Holz, the Leap controller’s inventor, said he constructed it to make “molding virtual clay as easy as molding clay in the real world.” Whereas the Leap may or may not immediately make a big splash with the general population, it is no surprise engineers working in 3D design spaces find it intriguing. Musk shows several combinations of the tech using a normal computer monitor, a 3D monitor, a free-standing glass projection screen, and the Oculus Rift. Using the Leap controller, he twirls and manipulates the SpaceX Merlin engine onscreen, recalling Tony Stark designing his Iron Man suit. Musk says they can transform these digital models into real, working metal rocket parts with a 3D printer. Folks immersed in CAD all day may note the system is comparatively rudimentary. Though the Leap device is precise (details down to 0.01 mm), it yet lacks a full encyclopedia of gestures and some complain of arm fatigue. No doubt, it will take some fiddling to make it as powerful as traditional input methods. But fiddling is what these guys do best. And as the Leap device finds practical purposes, professionals will work out the lingo. We know from sign language that gestures can be as rich as the spoken word. As for arm fatigue, designers might get tired compared to using a mouse or keyboard. But sculptors and artists regularly used their hands in a “gesture-based” manner. If it’s a matter of adaptation, the cost to adapt may become reasonable if the technology improves efficiency by leaps and bounds. And although we’re used to them now, regular mouse and keyboard use have been the source of their fair share of physical complaints and ailments over the years. Gesture-based controls may not catch on for everyday use right away, but in the hands of professionals, they may become a very powerful design tool, particularly as 3D interfaces become more immersive.